Brick Town Talk: Inspiration of the Day - 12/4/11 - LEGO Town, Architecture, Building Tips, Inspiration Ideas, and more! 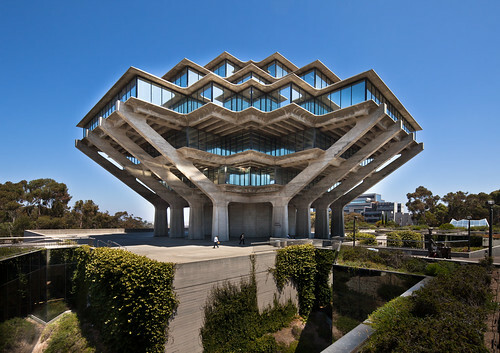 University of California, San Diego - (BTT) Easily one of the most iconic examples of brutalist architecture, the Geisel Library (named after at Theodor "Dr. Seuss" Geisel) the UCSD campus looks straight out a sci-fi movie - no surprise it has been featured in several over the years. Architect William Pereira, who completed this library in 1970, was truly one of the masters of the style, and the state of California is home to dozens of landmark worthy buildings of his work. While there are still a lot of people in which brutalism is remembered less than fondly, there has been a bit of a traction in the preservation movement as of late - it's worth remembering that more than just classically designed buildings are worth saving.